The 4K Ultra HD, 3D Blu-ray and Blu-ray feature a sneak peek of the upcoming DC Super Hero film, SHAZAM! The ocean comes alive when “Aquaman” arrives on Digital Download from April 6 and on 4K Ultra HD, 3D Blu-ray, Blu-ray and DVD on April 8. From Warner Bros. Home Entertainment, DC and director James Wan comes an action-packed adventure that spans the vast, visually breathtaking underwater world of the seven seas, “Aquaman,” starring Jason Momoa (“Justice League,” TV’s “Frontier,” TV’s “Game of Thrones”) in the title role. “Aquaman” also stars Amber Heard (“Justice League”, “Magic Mike XXL”), Oscar nominee Willem Dafoe (“Platoon”, “Spider-Man 2”), Patrick Wilson (“The Conjuring” films, “Watchmen”), Dolph Lundgren (“The Expendables” films), Yahya Abdul-Mateen II (TV’s “The Get Down”), Oscar winner Nicole Kidman (“The Hours”, “Lion”), Ludi Lin (“Power Rangers”) and Temuera Morrison (“Star Wars: Episode II – Attack of the Clones”, “Green Lantern”). The 4K Ultra HD, 3D Blu-ray and Blu-ray of “Aquaman” will include a three minute sneak preview of “Shazam!,” the upcoming live action feature film starring Zachary Levi as the DC Super Hero. The film will be released in cinemas on April 5, 2019. Fans can also own “Aquaman” via purchase from digital retailers beginning April 6. 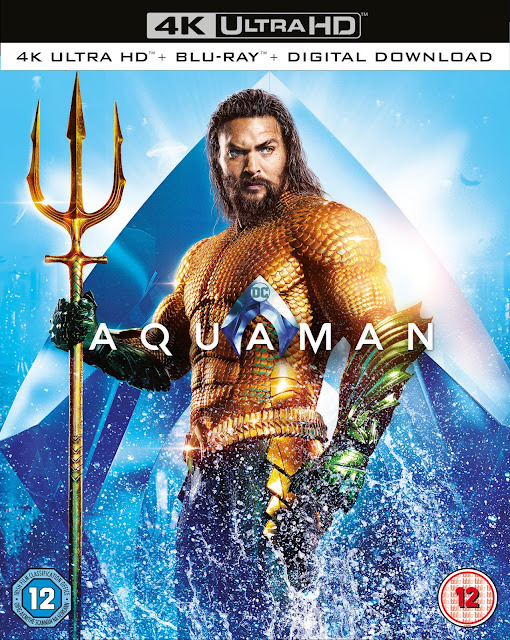 On April 6, “Aquaman” will be available to own in high definition and standard definition from select digital retailers.